BASSETERRE, ST. KITTS, JULY 23RD 2005 (CUOPM) - Major plans for converting the land around the Salt Pond at Frigate Bay into a community entertainment park and improving the beach so that economic activity can be generated for the local vendors have been outlined by Minister of State for Tourism, Sports and Culture, Sen. the Hon. Ricky Skerritt. He told St. Kitts and Nevis Prime Minister Dr. the Hon. 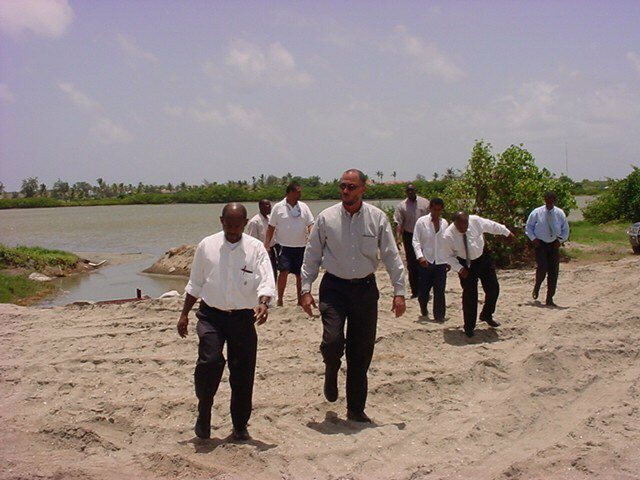 Denzil L. Douglas and other officials who were on a tour of Frigate Bay, that the proposed plans will generate the kind of economic and customer flows to justify having the local vendors on the beach so that they can benefit from the spin off, not only from citizens and residents patronising the area, but also cruise ship passengers and stay over visitors. “We are also discussing the installation of buoys that will allow yachts and other pleasure craft to moor in Frigate Bay. We intend to construct a tender pier that will service the dinghies from those yachts and pleasure craft. It gives them the means to come ashore and patronise the local vendors all year round and especially during the high season,” said Mr. Skerritt, who praised the workers of the Frigate Bay Development Corporation. “The beach has to be kept clean. The vendors booths have to be in an orderly manner, proper parking will be in designated in areas, the boating enhanced and the economic activity properly lay out and regularised,” said Skerritt. He said that as part of the enhancement of Frigate Bay, the existing booths will be relocated to provide additional beach space that will allow locals and visitors to enjoy the island’s natural resource. Minister Skerritt disclosed also that use of the road nearest to the beach will be discontinued and traffic will now flow on the main dirt road which now becomes a one way route allowing vehicles to flow in one direction. Cars will now enter just outside of Timothy Beach Hotel and exit on the other end at the road leading from Dolce Cabana. 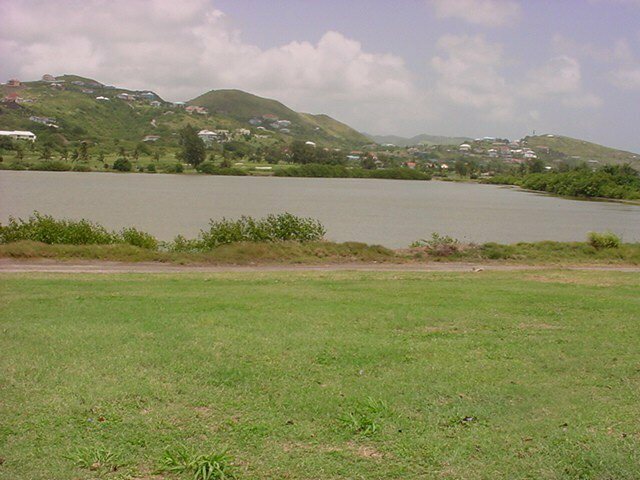 Chief Physical Planning Officer, Mr. Ellis Hazel said that as life was slowly returning to the 17-acre Salt Pond, plans are also being discussed to develop the area into a recreational fishing ground as well as for non motorised boating such as kayaking and canoeing. 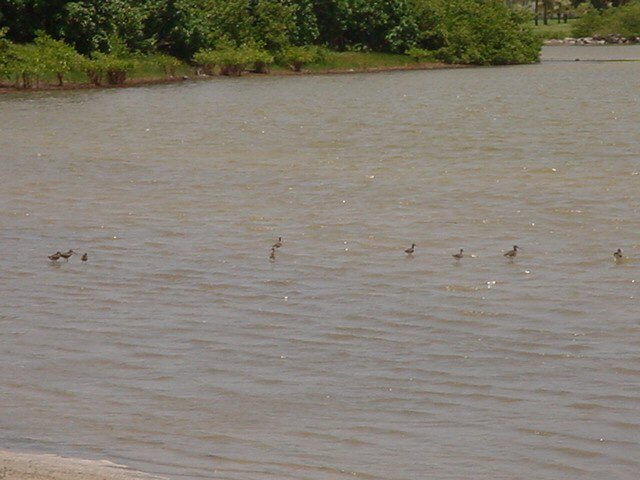 The 17 acre Frigate Bay Salt Pond with a new lease on life. He said the intention is to put in the basic infrastructure that would influence a recreational theme park with space for picnicking, kite flying and separate jogging, pedal biking and walking trails. Mr. Hazel said a project, being undertaken by the Frigate Bay Development Corporation and All Dive and Marine Company Ltd, has led to the installation of a mechanism to flush the Salt Pond to ensure its continued rehabilitation. “There is immediate evidence that the pond is now cleaner and this has led to more birds and an abundance of fish. This could now generate income from activities such as bird watching and pleasure fishing, providing additional income for local vendors,” said All Dive and Marine Company, Russell Rousseau, who added that tarpon, mullet and snook - three recognised game fish - that have begun to breed again in the ponds. Birds relishing a more healthier Frigate Bay Salt Pond. Skerritt pointed out that since the effort has begun, more and more local persons have been using the shaded areas for family outdoor activities. “We need to create more public green space. Our own people need that, Sir,” Minister Skerritt told Prime Minister Douglas. Photo # 1 St. Kitts and Nevis Prime Minister and Minister of Tourism, Dr. the Hon. Denzil L. Douglas and Minister of State for Tourism, Sen. the Hon. Ricky Skerritt lead other Cabinet Ministers, officials and representatives of the Frigate Bay Development Corporation on a tour of Frigate Bay. I'd love to hear from you! Please share your comments in the box below. Get free instant access to our newsletter archives. I promise to use it only to send you The St Kitts and Nevis Beach Buzz. 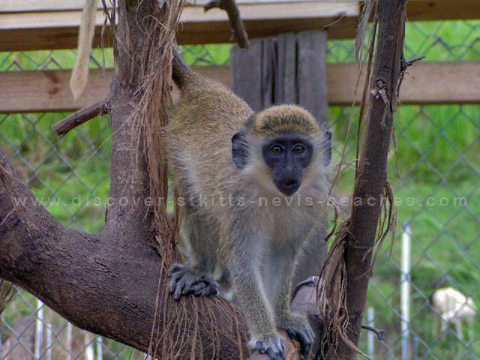 Exciting St Kitts tours and island safaris plus holistic body massages on the beach. An adventurous off road ATV excursion along sugar cane tractor paths and trails in the hills above Old Road. Not available to passengers on Thomson Dream, Aida Bella, Aida Luna, Norwegian Breakaway, Norwegian Epic, Wind Surf and Costa Mediterranea. Click image above to go to video page. Copyright © 2004-2015 Discover St Kitts Nevis Beaches.com. All rights reserved.